Taking time out from hanging with Bono and advising Central Asian dictators on how best to spin repression and executions, His Blairness has condescended to return to British politics to tell us things. And there are two things on his mind: Brexit and the election result. To save you the trouble, I’ve read his essay so you don’t have to. Boiling his argument down to its constituent parts, the first is the usual Brexit is bad and is a massive distraction from more pressing problems. Well, there’s no disagreement here. Brexit is bad, and one cannot deny that third country status outside of the single market and the customs union is going to cause major problems. That said, we shouldn’t just accept this situation. It’s the job of political leaders to act as educators and set forth a number of Brexit options, which could include an invitation for the EU to reform as a price of keeping our membership. According to some unspecified chats he’s had with the movers and the shakers, they want us to stay and are even willing to compromise on free movement. Oh really? Colour me sceptical. Some of us can remember the debacle of Dave’s negotiations with the EU early in 2016. He was then told repeatedly the “four freedoms” of the EU – the frictionless movement of goods, services, capital and people – are indivisible, and there is no budging on this. Over a year on and the answer is still the same. Managerially it might make sense for the EU27 to fudge it, but politically it’s an absolute no. Nothing would stir up far right populism more than Britain opting out of free movement of labour but retaining the benefits of everything else. So excuse my French when I say Blair is talking out his backside. The other problem is intractable nature of Brexit. Staying in the EU is not and cannot be on the table, regardless of whether it reforms or not unless there is a democratic vote to undo the referendum. Do we need reminding that setting aside a decision whose legitimacy is accepted by the vast majority is a really stupid and dangerous thing to do? As Blair notes, there is no political groundswell for revisiting the decision, and so we’re stuck. Blair can rail against this along with the other nostalgics who refuse to accept the result, but that’s what we’ve got to deal with. Again, while it makes economic sense to remain party to as many EU institutions and agreements as possible, in the end both the Tories and Labour have eyes on the politics. For the Tories, it’s about protecting the interests they’ve always protected and trying not to plunge themselves further into ruination. That also means not leaving openings to their right again. Labour, as outside the negotiating process, also has a very difficult line to tread. According to YouGov contra Blair, reacting against Brexit was not a self-reported reason for voting Labour (while guarding it was the main reason respondents gave for voting Tory), so the claims remainers are going to dump the party when they find out it is committed to seeing Brexit through is bunk. But it must be careful – being honest that Brexit is going to hurt and that only Labour can fix the messes and divisions the Tories have left is a start, but it much stretch every sinew to ensure the costs of Brexit are not borne by our people. An extremely difficult task in the best of times (you try managing a capitalist economy in the interests of the many), but one that is existential for Labour as it adjusts to the new class relationships of the 21st century. Get it wrong then Labour will get consigned to the history books. Hopeless on the politics of Brexit, I wasn’t holding out much for his analysis of the election result. Naturally, there was no reflection on why he called it wrong, but that’s par the course – two years on his remaining friends in the Labour Party still haven’t asked the key questions about Corbynism, let alone arrived at any answers about why it brushed them aside and won millions of new votes. That in mind, Blair is forced to suppress the Corbyn factor and talk up the rubbish Tory campaign. Undeniably it played its part, but if negativity toward Theresa May was the driving factor that would not explain the dramatic uplift in Jeremy Corbyn’s personal ratings. Indeed, according to the YouGov data above anti-Tory/anti-May sentiment combined fell well short of the main driver of Labour support, which was the manifesto. Jeremy as a positive reason to vote Labour wasn’t far behind either. Compare this to Tory voters, in which anti-Labour and anti-Jez motivations (combined) are way out in front. This isn’t surprising considering how the Tories are dependent on fear and loathing to cohere their vote. For Blair’s project however, it must simply ignore the evidence, and in this case it means passing over the appeal of Corbynism and pretending it’s nothing more than “unreconstructed hard left economics” that cannot “answer the call of the future”. Au contraire, the chord it struck for millions of people across the occupational range just goes to show they were the most modern politics on offer. 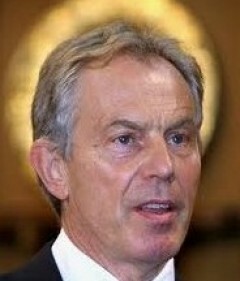 Those for whom Blair is “the master”, he does offer some hope. “People will default to populism when a radical centre is not on offer; where it is, they will vote it in, as Macron has shown”, he argues. Ah yes, Emmanuel Macron, the absurd “Jupiterian” (neo)liberal hero of France and his “complex thoughts”. Like Blair’s analysis of the British election, this observation requires overlooking a lot of things. Like the collapse of the Socialist Party for adopting the sort of politics Blair pursued in office (and Macron has promised more of), the collapse of the centre right that allowed him to get through by default to run off against Marine Le Pen, and the historically low turn out at last month’s parliamentary elections (48% and 43% in rounds one and two, respectively). Blair might think Macron represents a return to the centre, but it’s the last gasp of a knackered politics. One hopes a turn to the left might come as per Britain, but politics is unlikely to be straitjacketed by cosy liberalism for long. 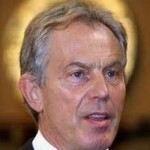 All that said, why bother paying attention to what Blair has to say? Believe me, I’d rather not have to but there are two very good reasons why we should. The first is because he gets wall-to-wall coverage in the media. It behoves us to take him seriously as an object of criticism just as so many of them take him seriously as an object of emulation. I recall his unhelpful intervention on Brexit during the Stoke-on-Trent Central by-election campaign and how much trouble it caused on the doorstep. The second point is he condenses the views of decaying liberalism. He acknowledges politics have changed, but he clings on to the same old same old. He offers up the centre ground as the source of solutions and, bizarrely, as the agent for change (“The space for the centre may seem smaller; but the need for it is ever bigger”). Such dogmatic insistence on a force that never existed is flatly delusional. Blair also talks of problems, but seems to think a bit of managerialism here and there’s going to sort things out. From his point of view and according to his own words, it appears the more things change the more they stay the same. Imperious in his arrogance yet ignorant of his obsolescence, Blair’s intervention epitomises the global establishment he represents. He may have been the future once, but increasingly socialism is the future now. It is the great assumption of New Labour that membership of the European Single Market is automatically good for jobs. They have swallowed the neo-liberal mantra lock, stock and barrel. It does not even occur to them that Britain voted Brexit because membership of the ESM has become an intolerable burden on UK industry, manufacturing, jobs and workers. That British capitalism can no longer deal with the rigours of international competition and that continued membership is itself a threat to jobs and to the economy. UK capitalism is moribund, stagnant, bankrupt, dead, decaying and with productivity figures that are plunging like a stone. Yes of course leaving the ESM is not going to be good for capitalism but neither is Remaining. In fact, either option promises an identical result. That is why, then, the only true option is a Socialist Brexit. v) Advance a socialist vision for a New European Settlement that favours workers over corporations mainly by not treating them like migrating cattle or leaving them behind in sink communities, sink estates and sink schools unable to compete for even the lowliest local job if in fact that job is even advertised locally. i) Theresa, is that you? ii) i) takes care of ii). What you are talking about is akin to hiring a racist bouncer to guard the door to a club no one wants to go to. iv) i) takes care of iv). There will not be any mega profits to socialise.